Moving to Seattle? Here’s where to buy the best mattress. Just found out you’re relocating to Seattle? Congratulations! Over the next few days, weeks, and even months, you’re going to be making lots of decisions. From new living arrangements, to furnishings, to tracking down your go-to neighborhood grocery store, there’s a lot to think about. 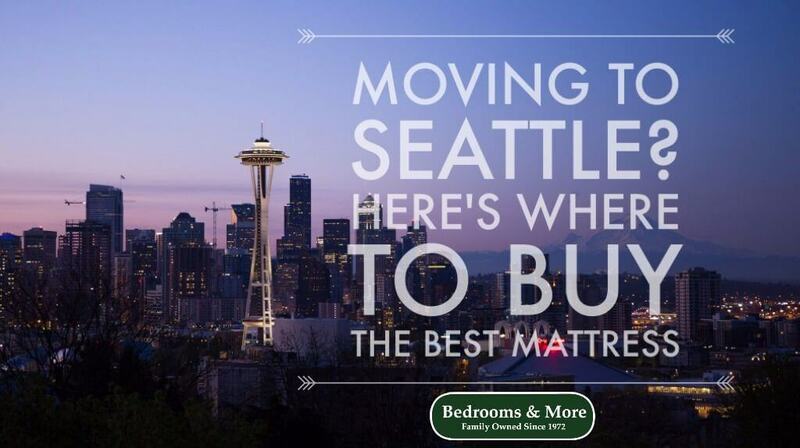 Moving to Seattle may feel like a big undertaking, but we can make at least one decision on your list a lot easier. One of the very first decisions you’ll be making is about where you’ll lay your head at night — literally. If you’re leaving your old bed behind or you think it’s time for a new mattress to match your new Seattle job — we want to help! At Bedrooms & More, we’ve been selling mattresses to the community here in Seattle for 46 years — from teachers and engineers, writers and marketers, artists and athletes, students and professors, to non-profit employees, healthcare workers, and people in tech. We’re less interested in making a sale than we are in matching you with the right two-sided, flippable mattress and great quality bedding to fit your needs, lifestyle, budget, and comfort preferences. Whether you like your sleep surface firm or plush, you dig futon-sleeping or love sleeping luxe, or you want a mattress as organic as your food, we’ve got the style and selection you’re looking for. We guarantee that all of our products will go the distance, no matter how many miles you may travel. We are serious about your sleep so you can work, play, and live better. Few things are as comforting to someone living in a new city as a mattress that just feels right. You’re one of us now, new Seattleite. Welcome to town. Now it’s time to meet your new bed. We’ll teach you how to pick just the right one for you! Join us any Saturday at 9:30 AM for a free class called “How To Shop For a Mattress”. Free coffee & fruit provided; no sales pitch. This entry was posted in Mattresses Seattle. Bookmark the permalink. Is Your Platform Bed Sturdy Enough?